MY CAR PET enjoys long romantic walks on the beach, watching football with the guys and spending time with that someone special. 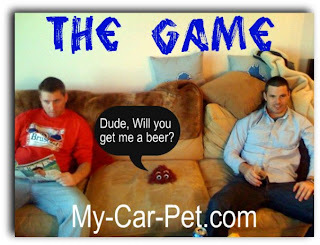 The inventor, Shaun Kruse, created the MY CAR PET carpet creature by accident. Shaun was walking to his car after a long day of work while reading a coupon book. Upon glancing at an ad for a carpet cleaning service, Shaun was confused as read their website's address realcleancarpets.com. As he broke the words down in his mind, he read "real" "clean" "car" "pets." After laughing and realizing that the word "carpet" is spelled "car pet," it occurred to Shaun that it would be funny to make a pet for your car out of carpet. It was at that moment that the idea behind My-Car-Pet.com was born. Each MY CAR PET carpet creature is hand crafted with love in the United States of America from retro color shag carpet, wiggle eyes, foamboard, pipe cleaners and ScotchTM brand clear mounting squares. Also, every carpet creature is signed and dated by the inventor/artist. I guess you could say that each one is a original piece of artwork. Accept no substitutes, buy one or two or three now! The MY CAR PET carpet creature is intended to make you laugh. 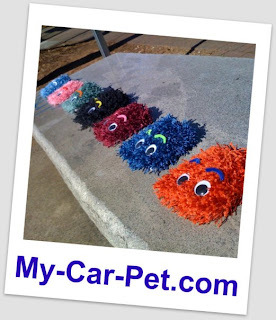 During these difficult times it is important to focus on the little things and we are positive that a MY CAR PET carpet creature will bring a smile to your face every time you get into your car. Remember... When Life Hands You Carpet, Make Car Pets!TM There are a few practical uses, including dusting your car's dash, however, it is not necessary for the MY CAR PET carpet creature to stay in your car as you can see in our picture gallery. Who knows, it may become one of the guys/girls! I saw OUR because as soon as I received My Car Pet, my daughter scooped her up! It's her new friend, or as she says, her Car Pet! She loves it! I think it's cute, and a great idea for something most would say is so mundane! Would you like to win one? 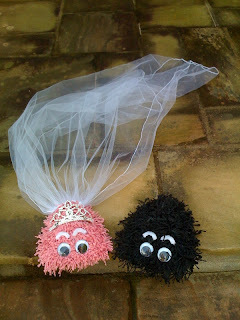 The 3 most creative uses for My Car Pet will win a Car Pet for their own home! 2 will win here and 1 will win at Moody Mama Says, so make sure you go over there and enter too! Please fill out the form below. Main rule is to suggest a CREATIVE use for a My Car Pet. There's no end to the possibilities here, so be creative! For extra entries, please visit Moody Mama Says and Everyday Baby Steps! Just leave a comment here with which giveaway you entered.